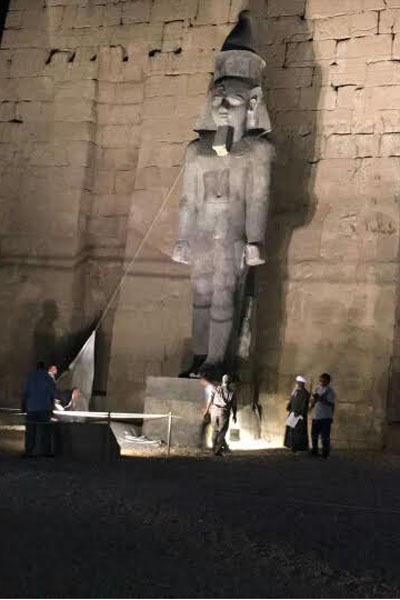 Egypt's Ministry of Antiquities re-erected on Tuesday a colossus of King Ramses II that once decorated the façade of the first pylon of Luxor Temple, after concluding comprehensive restoration and reconstruction work upon it. 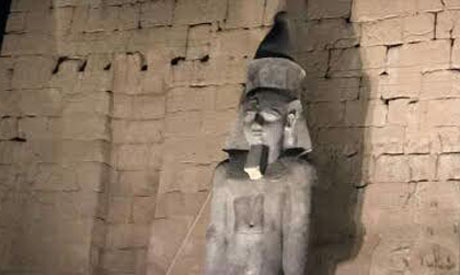 Head of Luxor Antiquities Mostafa Waziri told Ahram Online that restoration began on the statue in November 2016. In 1958, an Egyptian archaeological mission led by Mohamed Abdel-Qader uncovered the statue, which had broken into 57 parts -- damages sustained during a destructive earthquake in the fourth century AD. “These blocks were removed and placed [in the interim period] in wooden shelters on the first pylon's western side,” Waziri said. The statue is carved in black granite, weighs 75 tonnes and stands 11 metres tall from the base to the crown. It depicts Ramses II standing, wearing the double crown and posing with his left leg in front of him. Beside him stands a 1.5 metre statue of his wife Queen Nefertari. Originally, the colossus stood in front of Luxor's first pylon along with five others. Four of these colossi depict the king standing while the other two show him in a seated position.